The proposed Highthorn opencast mine on the Northumberland coast has been rejected by the Secretary of State. The decision, by Sajid Javid, was issued today after a 14-day public inquiry took place last June in front of an independent Planning Inspector who then submitted his report to Mr Javid on November 29 last year. 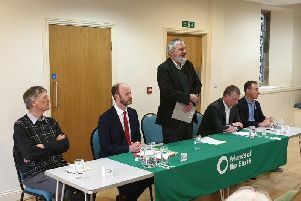 Planning Inspector John Woolcock recommended that the application should be approved, but Mr Javid disagreed with the Inspector’s recommendation and has refused planning permission. This can be challenged in the High Court. The boss of Banks Mining has slammed the Communities Secretary for his decision to ignore the planning inspector's recommendation. Mr Javid's decision letter explains that having balanced the various factors - harm to the landscape character of the area, negative impact on greenhouse gases and climate change, negative impact on tourism and recreation and the impact on agriculture versus the benefits of the coal extraction, including economic benefits, and the biodiversity benefits - 'he finds that the national, local and community benefits of the proposal would not clearly outweigh the likely adverse impacts such as to justify the grant of planning permission'. A Ministry of Housing Communities and Local Government spokesman said: "Communities Secretary Sajid Javid has today refused planning permission for a surface mine for the extraction of coal at Highthorn, Druridge Bay, Northumberland. He has considered all the evidence heard at the public inquiry, together with the recommendation of the Planning Inspector. His decision took account of all material considerations, including the potential environmental impacts of the scheme." In July 2016, Northumberland County Council’s strategic planning committee followed the planning officers' recommendation and approved Banks Mining’s proposals, for a 325-hectare site near Widdrington and Druridge Bay. However, in September that year, it was announced that the bid would be decided by the Secretary of State, Sajid Javid, after he decided to call in the plan. The scheme is for the extraction of three million tonnes of coal and a total of 20,000 tonnes of fireclay and sandstone over a five-year period with total operations lasting seven years, taking account of the time to set up the site and complete restoration.